Log Wash is the best product to use for cleaning all bare wood surfaces. Besides removing dirt, dust, pollen, sanding and blasting media residue Log Wash will remove many types of bare wood discolorations including brown chemical stains. We strongly recommend that all bare wood surfaces be washed and conditioned with a Log Wash solution before applying any Lifeline finish systems. Use Log Wash for washing the dust and dirt off interior and exterior finished wood surfaces. Its unique formulation removes dust, dirt and other contaminates from walls and chinking without harming the existing finish. Washing your home once or twice a year with Log Wash will keep your Lifeline finish looking great and will help extend its life. We loved finding a product that we knew would be appropriate for our logs, which were filthy due to putting off washing for too long. The price was better than we expected for a specialty product too. It was recommended on several log home forums, and we'd recommend it too. This product is a MUST USE!! Our home had originally been stained with an oil-based stain - with the exception of the east side...because we never finished! We simply used Log Wash as instructed on the entire house, and WOW!! It looked brand new - removed the old stain, dirt and weathering on all sides! Fantastic product - we use it as an annual cleaner, not only on the house, but other extrerior wood objects! I was actually blown away by the results of Log Wash. Our home had been neglected from a good washing for several years. We had it corncob blasted and resealed/stained about 5 years ago, but once that was complete, we honestly got caught up in life. There was a significant amount of green mold showing on the north side of the exterior of the home. We mixed the solution up in a pump sprayer, sprayed down small sections of our home at a time, and let it sit for about 15-20 minutes on the house before power washing off the cleaner. Not only did the mildew wash away, but there was quite a bit of dirt and grime cleared away as well as the color of our home really started to shine again! Results were amazing and our home looks brand new again! Can’t wait for spring to give it another wash after winter! Will definitely purchase again and use this regularly. Our home was dirty from several years of not being cleaned so we tried your Log Wash product which came highly recommended. After washing wit the Log Wash the home regained it's luster and looked brand new! We just finished our annual maintenance wash of our home and it's still looking GREAT!!!! It's a really easy process, and between the wife and I we got it done really quickly. Lots of Log Wash left to use, as the concentrate goes a long way. We were told about the Log Wash product when we had finally decided to use Lifeline Interior Lt Natural and Acrylic Gloss as our finish for our interior log sided walls. We used 1 cup Log Wash solution per 1 gallon of warm water ratio as indicated. I was very impressed with how it removed the dirt, dust, and buildup on the walls. After cleaning and now staining/sealing, our walls look great!!! Good cleaner and it seemed to work pretty well! I really liked that Log Wash was easy to apply with a garden sprayer and then a water hose with a nozzle was all that was needed for rinsing. We used it to clean a new hunting cabin that my husband built. We are preparing to stain it soon. This product worked great at removing most of the dirt and mildew buildup on my log cabin, but I did end up having to use a soft bristle car wash brush to do some scrubbing on the bottom logs of the cabin. It was a lot of hard work, but my cabin is clean and looks a lot better. We are planning to recoat it with the Ultra-2 stain and Advance topcoat soon. This is a really good product! We have used Log Wash twice a year since we restored the finish a couple years ago and the home always looks great. We're going to apply the second coat of Advance this year when the weather allows it, and we'll wash it again right before we apply to insure a really good, clean surface. Found out it also keeps the decks clean as well. One of those handy to have around products!! I used the Lifeline Exterior finish system a couple years ago and needed to clean off the dust and pollen from the logs, Perma-Chink recommended Log Wash log cleaner, and it worked as expected. 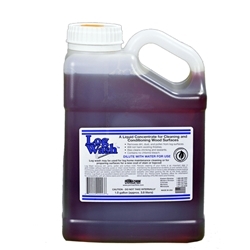 Log Wash concentrate gallon, if used with 1 cup per gallon of water expect 3000 sq.ft. for maintenance cleaning. At 2 cups per gallon of water expect 1500 sq.ft. for cleaning bare wood. © 2019. Perma-Chink Systems, Inc. All Rights Reserved.